It’s getting to that time of year, where you like to snuggle down with a bowl of popcorn and a good movie. Although we are very much a “there’s no such thing as bad weather” kind of family, we do have weekends where we’ll chose a cosy family movie session over braving the tempestuous Scottish weather in the park. And this weekend we’ll definitely be trying to get in a movie or two, regardless of the weather, because there are some great Hallowe’en movies just asking to be watched! Not horror movies, mind you. I’m not a fan of horror movies. In fact, I’m not just not a fan, I hate them. I just can’t watch them. But there are plenty of other movies out there, which are perfect for Hallowe’en and which are family-friendly too so I can share with my kids. This is the perfect Hallowe’en movie to watch with the very little ones. It’s short (around 25 minutes), it’s not scary at all, and it’s based on a much loved children’s book that we all know off by heart. It’s very true to the book, and they’ve done a great job of animating it. For those not familiar with it, there’s a witch and her cat flying around on her broomstick, and she looses several things, which a dog, a bird and a frog help her to retrieve. She invites them on to the broomstick, much to the annoyance of the cat. But when the broom ends up breaking from the added weight, and a fire breathing dragon threatens to eat the witch, the animals all come together to save the day. We watched this with both boys last year, when our youngest was only 2, and they loved it. My older boy (now almost 7) is starting to grow out of it, but still enjoys it. In a nutshell: Best choice for the very little ones. We all watched this animated movie together about two weeks about, for the first time, and loved it! The backstory is, that Dracula built a hotel in 1895 to raise his beloved daughter Mavis in a safe environment, after the death of his wife. Skip forward 118 years, to the daughter’s coming-of-age birthday party, to which all of Dracula’s spooky friends – who are also regular customers of the hotel – have been invited. But then 21 year old Jonathan infiltrates the hotel, and, inevitably, him and Mavis “zing”. What happens when the other monsters find out there is a human among them? Can Jonathan and Mavis ever be together? Watch to find out! This movie is rated a PG. Neither of the boys found it scary, though a lot of jokes went over the little one’s head. It’s around 90 minutes long. There’s a second movie too, which we definitely want to watch soon. In a nutshell: Great for the whole family. Casper the Friendly Ghost started out as a cartoon character, before he went on to star in a series of live action movies. In this movie, Caspar has been living most of his afterlife in an old mansion called Whipstaff Manor with his three uncles, who are as much nasty ghosts as Caspar is a friendly one. When a greedy heiress inherits the haunted mansion, she hires a paranormal expert to get rid of the ghosts, so that she can get at the treasure they are guarding. He moves on to the mansion with his teenage daughter Kat, who becomes friends with Caspar and helps him remember his previous life. Caspar, who is smitten with her, longs to become human again so they can be together. But after Kat’s father accidentally falls to his death and turns in to a ghost himself, Casper sacrifices his one chance to become human again, restoring Kat’s father to life again instead. This movie is rated PG. I don’t think it’s suitable for our younger boy, but I think the combination of slightly slapstick humour and family friendly scariness would appeal to our (almost) 7 year old. It runs at around 100 minutes. You can’t go wrong with a bit of harmless Wallace and Gromit. Despite its mildly scary undertones, The Curse of the Were-Rabbit is mostly a funny and charming family movie. I don’t want to give any of the mystery away, for those who haven’t seen it, the plot evolves around the mystery of who is sabotaging the vegetable gardens across the village, threatening the annual vegetable growing contest. There are a couple of innuendos and covert adult humour, but that went right over my boys’ heads whilst still giving us adults something to snigger about. Some kids may be spooked by the Were-Rabbit’s transformation, though neither of my boys was scared at all. We had recently read a picture book about a boy who turns in to a were-wolf, and they made the connection and thought the idea of a were-rabbit was hilarious. The movie is rated as a G (general audience) and runs around 85 minutes long. In a nutshell: Another great choice for the whole family, with some covert adult humour for the grownups. And, last but not least, perhaps not one for the very little ones, but you can’t do a post about Hallowe’en family movies and not mention Hocus Pocus! I don’t think it needs any further introduction, does it? Only the best Hallowe’en movie ever. I went to see it three times at the cinema when it first came out! There are a couple of minor scary bits, but I’ll definitely be introducing my older boy to it this year! It’s rated PG and runs around 95 minutes long. How about you? 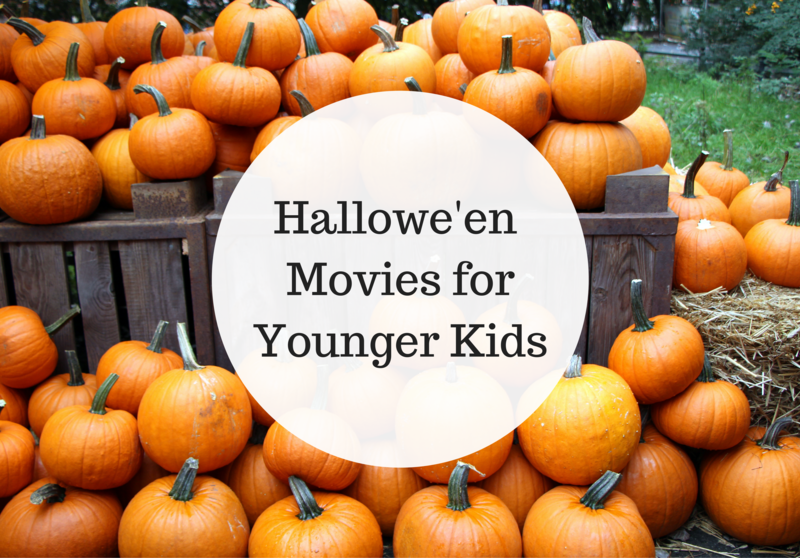 What are your favourite Hallowe’en movies to watch with kids? Feel free to share in the comments below.